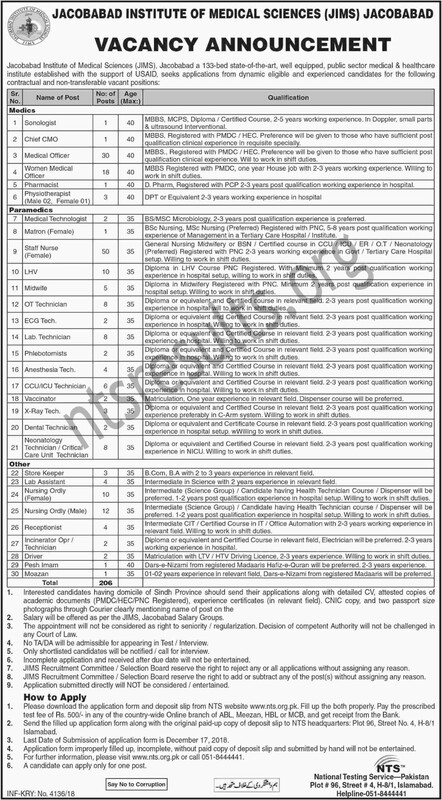 Jacobabad Institute of Medical Sciences JIMS Jobs Via NTS has been announce. Last date to apply is Monday, 17th December 2018. JIMS is one of the most reliable healthcare systems for the people of Jacobabad neighbouring districts of Sindh and Balochistan province. Jacobabad Institute of Medical Sciences provides exceptional healthcare services and it is fully equipped with medical facilities. The day to day affairs of the institute are fully controlled by the Director of JIMS. Jacobabad Institute of Medical Sciences (JIMS), Jacobabad is an autonomous health facility under the supervision of Health Department, Government of Sindh. The JIMS constructed by USAID Pakistan under MoU signed by Government of Sindh and handed over to Department of Health on 6th April, 2016. The institute is located in northern Sindh in District Jacobabad boarding with Balochistan province. JIMS seeks application from dynamic eligible and experience candidates. The jobs in JIMS are on contract basis as well as non transferable posts. All those candidates who are eligible for the JIMS Jobs Via NTS must apply to avail this golden opportunity. Terms & conditions as well as other requirements for Jacobabad Institute of Medical Sciences JIMS Jobs are describe below.